Some of you think Americans have it bad when it comes to buying a car. With low car prices, cheap gas and a great road network, I say you're one of the lucky ones. Don't believe me? Just check out how much it costs to buy a Prius or FR-S in one of these countries. Technically, you can buy or sell cars in Cuba since the market was "liberated" in 2011, but with prices sky high and low incomes all around, business is slow. A 70s lada is about 12K USD in Cuba, it's quite interesting to see how values change depending on what you can get out of the car and when reliability is so important. I know this because I was born there and went this summer for about 10 days to visit the fam. Worst place to be a car BUYER? Cuba. Price of a new Scion FR-S: Your soul won't be enough. Kim Jong-un must really like you to get a car, and you better keep it that way, because it's not only your ride that's always on the edge. That's not a real Merc. It's the glorious Pyongyang 4.10, from a factory that used to make GAZ-51 clones (a prewar Soviet light truck). They might share the same engine, so there may well be some running on the same wood-gas conversion that's popular in North Korean trucks because supplies of conventional fuel are patchy. Build quality is abysmal, but it's better than trying to buy some old imported Volga since nobody's been able to import spare parts in the last twenty years. Most people can't actually buy a car. And the car market is pretty much subject to government whims - good luck with fuel rationing and travel permits. One day Kim Jong-Il got so irritated by having to wait behind a Japanese car (in what must be the only traffic congestion ever experienced in the gloriously smooth-running republic) that he ordered all Japanese cars confiscated. I want a Pyongyang 4.10 2.5 Evo 2, now! St. Kitts is a tiny little island, I do business there on occasion so I'll frequent from time to time. But I went to the toyota dealer to get a new headlight for my car and I saw that (this was in late 2012) so there's always that no? Oh and speaking of which, because new cars are so expensive, used cars are the rage! Hence I own this super cool 1990 Toyota Sprinter Cielo (Corolla Sport in Europe and Geo Prism GSi in the States) it's a RHD, 5-speed hatchback with a glorious 4A-GZE (supercharged) and AWD...perfect island car. I drive it maybe once or twice a year at this point, but it's still nice to know it's there. I'm currently struggling to buy a second hand car in the UK. The cars themselves are dirt cheap, but the insurance for a 28 year old male who has only been in the country for 2 years is just terrifyingly expensive. To insure an elderly 2.0 156 (if I don't lie to the insurance company) was going to cost me between £4,500 and £9,000! The car would only be worth £1000. Price of a new Scion FR-S: It's not on sale, but a Prius is $36,559. Corolla 2014 in US - $16k starting price- considered a compact. Corolla 2014 in Brazil: 25K starting price - consider a luxury car. When carmakers organize the first drive events for the press, they leave the Chinese group for last, because they will smash the cars anyway. It's a given. China. If it is not a knock-off it is ridiculously expensive. Combine that with terrible traffic and tons of smog and it just seems like an awful place to be an enthusiast. The only good thing is there are plenty of special China only editions available, but only if you can afford them— You can't. 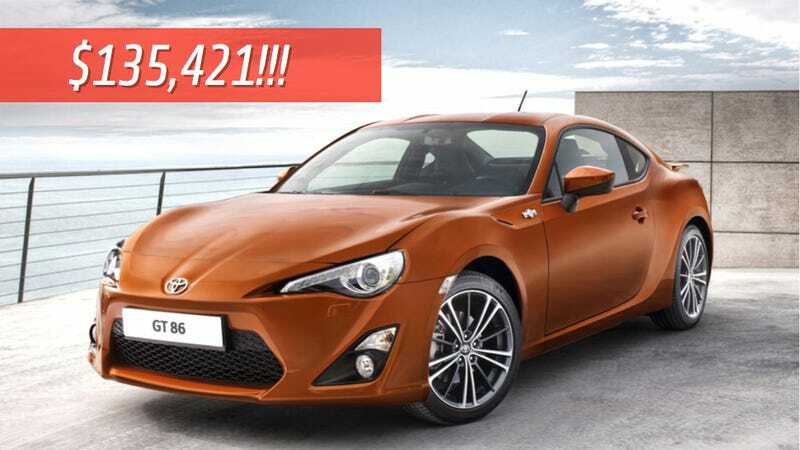 Price of a new Scion FR-S: It's on sale, but they keep it a secret, so it must be a lot. Nicaragua (or any other place in Latin America for that matter) is the worst place to be a car buyer. The prices are outrageous, even for cars that are genuinely terrible. Expect to pay the equivalent of thousands of dollars for a 20+ year old beater. If you can even afford a car, which most people there can't. If you do own one, expect it to A.) Break down constantly and B.) Get stolen almost immediately. Forget buying a new car because there aren't any. Even if there were the import tariffs are so high you can't, because you're broke. Definetly I only have 1 answer.. It's a bit too much. How about base model RR Ghost? I would like to nominate Malaysia. Where in Malaysia, the Toyobaru twins cost around $75,000 new while Mercedes SLS AMG cost around $600,000 brand new . This is where a beige mobile such as the Accord and Camry are consider as a luxury car. Plus, Many Malaysian spec car lacks in many safety features but still sold at a higher price. Due to high excise tax and Protection policy for our Local car maker Proton, Many people here only can dream owning a BRZ or a Miata. Singapore is trying to get rid of congestion by making it almost impossible to own a car. As you can see from the picture, it doesn't work. Singapore. Cars are VERY expensive, and you can&apos;t mod your car in an easy way.